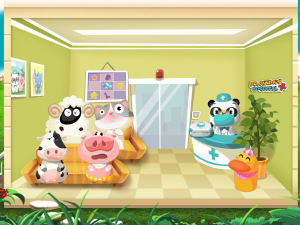 Check into Dr. Panda’s Hospital, where little ones can help sick animals feel so much better. One of the few apps that’s truly easy enough for toddlers and preschoolers while being fun for the older crowd. Fill in the blank: When I grow up, I want to be a _________. Depending on how old you are, the blank can be anything from ballerina to nuclear physicist. Chances are that when you were a kid you wanted to be a vet or a doctor – before you learned about the interest rate on a student loan. Luckily, Dr. Panda’s Hospital is much cheaper and doesn’t require years of schooling. 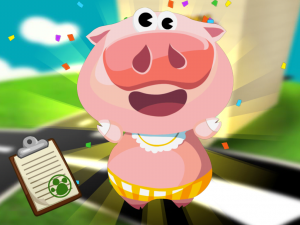 In this adorable “play pretend” app children can virtually treat animal patients with a range of ailments, while keeping them comfortable in a hospital setting. There are no time limits, point scoring systems, or written directions; all of which means that even the youngest of players will be able to call themselves “doctor”. From the helicopter landing pad to the waiting room and two patient rooms, players have control of the entire “patient” experience. Hospital beds can be transformed in to a princess castle or fire truck to make sick animals happy. Flowers are watered to bloom and cheer up the room. Trash littered across the floor is picked up to make everything neat, tidy, and sanitary. 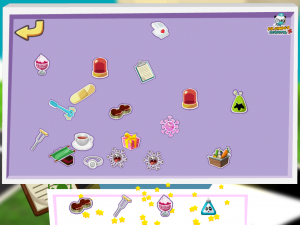 Once the patients are comfy and their treatments have been administered, players can choose a sticker to put on their board. The illnesses of the animals and the subsequent treatments provide entertainment and teachable moments. Watching a pig put his, uhh, rear in the air in preparation for an injection made my son giggle and then ask if shots actually go there. 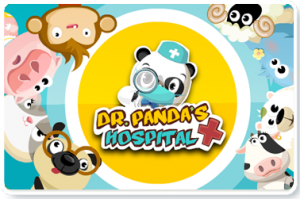 Dr. Panda’s Hospital is a bargain at $1.99, but there is a lite version available for free to try 3 of the mini-games in the full version.